I am a Pinterest addict. I love Pinterest. I have found so many great projects and amazing recipes. There is one chicken recipe so far that has been the favorite in my household. I CRAVE this chicken it is soooo good!! I found this chicken recipe on Pinterest and it was pinned from www.wittyinthecity.com. The authors of the post adapted the recipe from “The I ❤ Trader Joe’s Cookbook” by Cherie Mercer Twoky. 2. 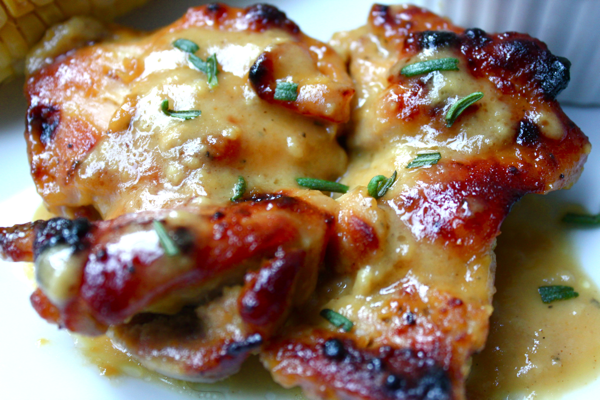 Mix together 1/2 cup dijon mustard, 1/4 cup maple syrup, and 1 tablespoon rice wine vinegar. I added a little bit extra of all so I could have extra sauce. It’s sooooo yummy over rice!! 3. Put the package of chicken thighs into an oven-proof baking dish. Salt & pepper the thighs and pour the sauce mixture over them. Turn the thighs over a couple of times to get them fully coated. The recipe says to use a foil-lined dish, however, I baked them in one of my Pampered Chef stoneware bakers and did not use foil. 4. Bake for 40 minutes or until a meat thermometer reads 165F. Baste the chicken with the sauce halfway through cooking. I like to then broil them for about 5-7 minutes to get the crispiness shown in the photo. 5. Let the chicken rest for a few minutes but make sure to spoon some sauce over the chicken. Sprinkle with herbs or green onions for taste. I recommend serving over brown rice. Just writing this is making me salivate and dream of making some of this chicken for dinner tonight!! I like to use the bone in thighs but feel free to try it with the boneless thighs. There is no copyright infingement meant here and I have given credit to all I can for where I obtained the recipe. This entry was posted in Recipes, Recipes - Main Meals and tagged chicken, dijon, dijon mustard, dinner, Food, maple, Recipe, rice wine vinegar, thighs by tiannafonz. Bookmark the permalink.